Here are some updated photos of Annie. She has been with us 1 1/2 years and is an integral part of our family. She takes turns sleeping in all of our bedrooms, and especially likes our son's bean bag chair. 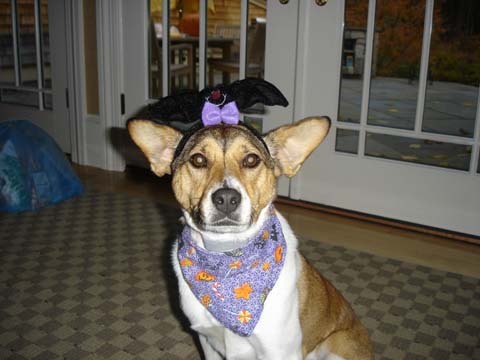 As you can see she even went trick or treating at Halloween. 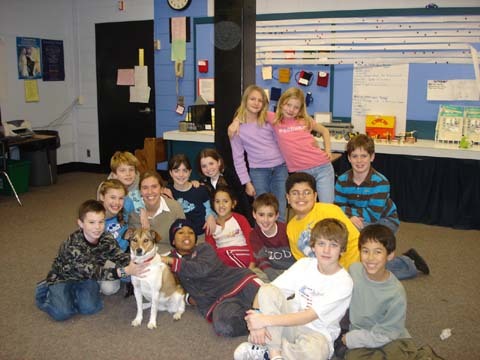 She visited Justin's 5th grade class and thoroughly enjoyed meeting the class. Annie loves the snow, although even she was a bit intimidated by the 6 foot drifts from the last storm. Here is an update on Noodle, now known as Annie. Annie is so assimilated into our household that I can't believe she's with us less than 1 year. Even our 14 year old cat Chelsea, has really taken to her. The cat who has never lived with a dog, and was very timid for most of her life, actually lays in Annie's crate with her sometimes during the day, with the door open. Annie only stays in the crate when we are not home (due to some early chewing problems). During the night Annie sleeps with our son, Justin (9) while the cat sleeps with our daughter, Marisa (6). However both Annie and Chelsea sleep with my husband and I sometimes. Annie (officially named Queen of Annie's Noodles--for the boxed mac and cheese) is sweet, loving, mellow and yet very playful. She loves to bring us toys for tug of war and just loves to be outside running. She has quite a nose too. Everywhere we go people ask us what kind of dog she is. Corgi, Shelti, Beagle, Jack Russell--who knows? We just know she is a lucky dog and we are lucky to have found her. I'll send you an updated photo soon!